Construction Composites Market size was over USD 45 billion in 2017 and is projected to expand at over 4.5% CAGR over the forecast timeframe. Construction composites market is driven by the rising product demand in the construction industry due to its long life and low maintenance cost. Rapid urbanization and growing per capita income in the emerging countries is giving rise to construction of high end buildings and innovative construction embedded with new technology, that requires various composites to make the building durable and resistant in all conditions. Reinforced material (composites) used in construction are prepared from two or more constituent materials with considerably separate physical or chemical properties, when combined, produces a material with features different from the individual components. 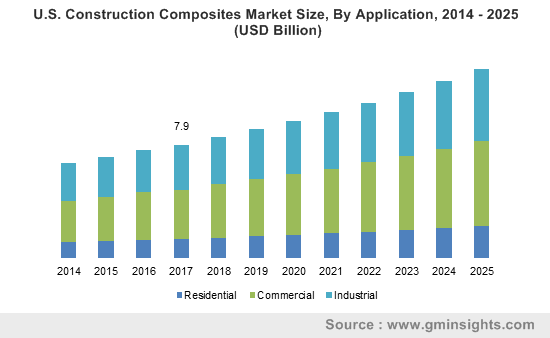 Robust reinforced material demand such as advanced polymer composites in the construction industry will propel the global construction composite market size over 4.5% CAGR. Asia Pacific accounts for a major chunk of the overall construction industry mainly due to large markets including China, India and Japan. Furthermore, Indonesia and Malaysia are making substantial investment in the new construction projects which will trigger construction industry in the region and will make notable impact on the construction composites market size over the projected timeframe. For instance, in 2014 the total construction volume accumulated in the ASEAN countries (Malaysia, Thailand, Indonesia, Singapore, Vietnam, Philippines) has been over USD 16 Billion but five years later due to extensive construction activities it grew to USD 24 Billion in 2018. Also, increasing high end building constructions in the Middle East region would also drive the construction composite market, since high end building constructions require durable and tensile composites for the long life of the building and to reduce maintenance cost. High composite price due to its complex production process and stringent government regulations may become a hindrance for the reinforced materials for construction market. Additionally, lack of awareness about value adding product properties including durability, improved workability, reducing time, etc. is another major factor which is probable to hamper the construction composites market in the near future. Substantial fiberglass use in building and construction sector for insulation applications will propel the industry growth further over the near future. High strength and lightweight properties are the driving factor for the growth of this construction composites market product segment. It is mostly used in thermal and electrical insulation application and is spread in the attics to maintain temperature inside the building. For instance, China National Building Material Company (CNBM) and the Industrial Development and Renovation Organization of Iran, have signed a USD 74 million contract set up a fiberglass & composite manufacturing plant in Marand, East Azarbaijan Province, with an annual capacity close to 30 kilo tons. Therefore, the market is expected to grow on account of increased construction spending in both developed and developing countries. Reinforced materials are increasingly being used as substitutes for railing products and traditional decking, such as aluminum, wood and steel. The commercial and industrial segments are projected to be the higher revenue-generating segments due to the increasing demand for low-maintenance and durable products. In addition, the growing infrastructure spending across the globe is expected to further augment the construction composites market demand. The commercial application was the largest segment of all and is expected to grow at the CAGR of close to 5% during the forecast period. This is attributed to the increasing commercial construction activities in emerging nations such as India, China, South Korea, Brazil etc. Asia Pacific is the largest region due to the increasing urbanization coupled with rising government investment in the major projects across residential, commercial and industrial sector will make prominent contribution to the business size in the forecast timespan. For instance, Malaysia has been awarded new and on-going infrastructure projects worth USD 22 billion in 2017-18 on public infrastructure and residential housing. Additionally, Indonesia spending on infrastructure is projected to surpass USD 165 billion by 2025 which will have substantial impact on the construction composites market size over the forecast timespan. The rapid growth of the construction industry in countries such as India and China are expected to propel the demand for construction composites in industrial applications since, industrial growth in these countries is expected to impact the market. 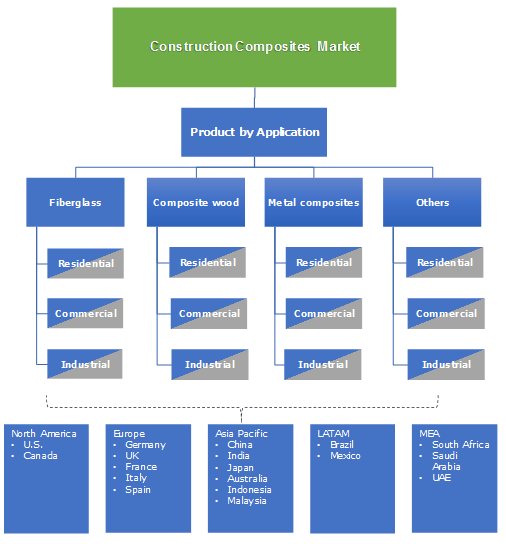 Construction composites market share is competitive owing to the presence of few large-scale manufacturers. Prominent industry share contributors are Bedford Reinforced Plastics, Advanced Environmental Recycling Technologies, Inc., Diversified Structural Composites, UPM Biocomposites, Exel Composites Oyj, Jamco Corporation, Strongwell Corporation, Schoeck International, Trex Company, Inc., Fiberon LLC, Fibrolux GmbH and Hughes Brothers, Inc.
Key industry players are acquiring smaller businesses to expand their product portfolio and attain competitive edge over its competitors globally. For instance, Exel Composites Plc, has signed an agreement to acquire 100 per cent of the shares in Diversified Structural Composites, Inc. (DSC), a composites company, from Teijin Carbon America, Inc. a subsidiary of Teijin, a global carbon fiber manufacturer. The acquisition of DSC will make Exel Composites the only pultrusion company with significant presence on all three major continents. This way Exel Composites aims to improve its global supply position to the markets. Construction composites such as fiberglass, wood composites, metal composites, etc. have main application in the construction of residential, commercial and industrial applications. The study covers all the composites used across construction sector except concrete. Composites are material made from two or more constituent materials with considerably different chemical or physical properties, which is combined to produce a material with characteristics different from the individual components. The individual components remain separate and distinct within the finished structure. Rising construction activities mainly in Asia Pacific has propelled demand for reinforced materials used across construction industry will boost the market by 2025. Furthermore, growing technology in modern construction require more of these construction composites for lowering the maintenance cost. These trends will have positive impact on the construction composites market size over the projected timeframe.